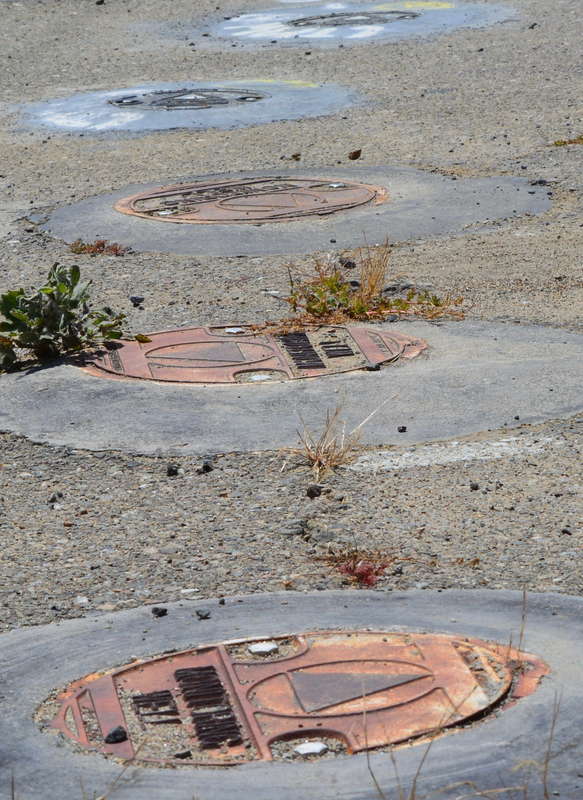 Groundwater cleanup is a good place to look at how the process has been working at Alameda Point, considering that is where the majority of the contamination has been. The groundwater contamination resulted from releases of jet fuel and cleaning solvent and two leaky gas stations. This cleanup has left the base riddled with groundwater sampling wells and injection wells used for injecting cleanup solutions or extracting pollutants. 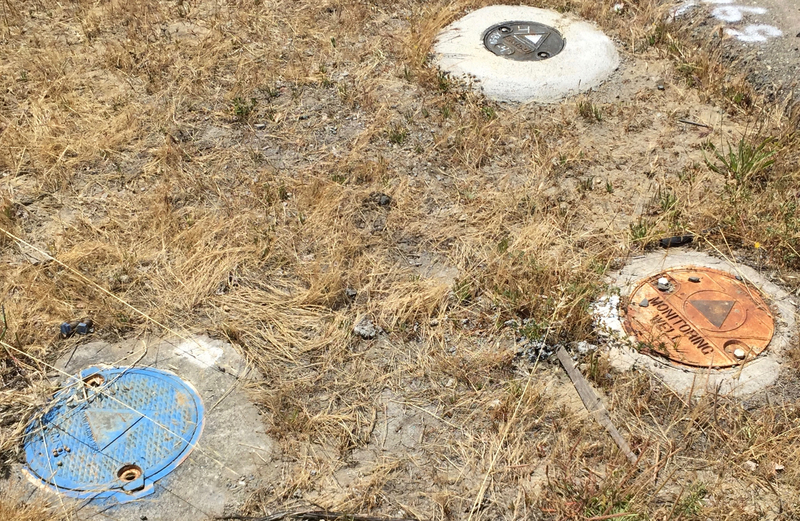 Old and new groundwater monitoring wells. When a cleaning solvent called trichloroethene (TCE), for example, is cleaned up, it is not a one-time effort and, presto, it’s gone. TCE is not actually removed from the ground, but rather broken apart into less and less harmful compounds through multiple treatments until it ends up as a harmless gas. When a groundwater sample is taken after treatment, the TCE may be gone, but there are still going to be the other compounds that are still toxic. The Navy and federal and state regulators expect to see evidence of these compounds to determine progress. For a contractor to fake their way to the finish line would require a special lab that engineered fake water samples with a pinch of contaminants. They would also need to include varying amounts of 22 naturally occurring metals that provide data on how the treatment is reacting with the soil. It simply wouldn’t work to scoop up some water from the Seaplane Lagoon, a storm drain, or a faucet and submit it as a legitimate sample. A good example of the built-in checks and balances of groundwater cleanup is Site 6 at the hangar next to the Air Museum. Industrial cleaning solvent from a dipping tank used for cleaning aircraft parts was released into the ground. The Navy and regulators agreed that two different cleanup methods would need to be employed in two different phases. Map showing Site 6 solvent cleanup area at Alameda Point. Google map with added notations. A company called URS was hired for the first cleanup phase in 2010. URS performed its own water testing prior to beginning work to determine where and how much cleaning solution to inject to oxidize and breakdown the solvent. Their tests also served as a confirmation of testing in 2004 by a different contractor to determine the extent of the problem. 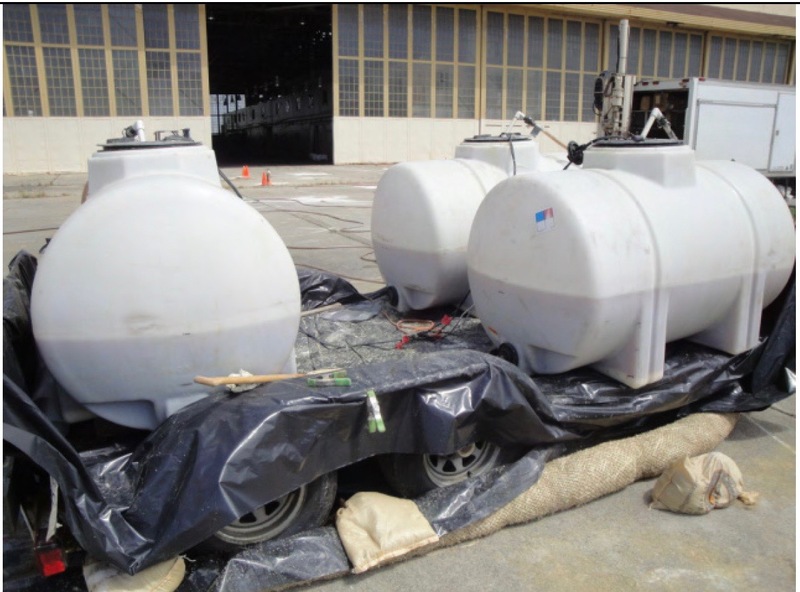 Tanks of cleanup chemicals that are mixed and injected into groundwater to breakdown TCE solvent through oxidation. Building/Hangar 41 in background is in Site 6 and is leased by Wrightspeed. Navy photo. URS drew water samples after their treatment work and sent them to an independent lab. Yet another lab was hired to perform random checks to validate those tests. 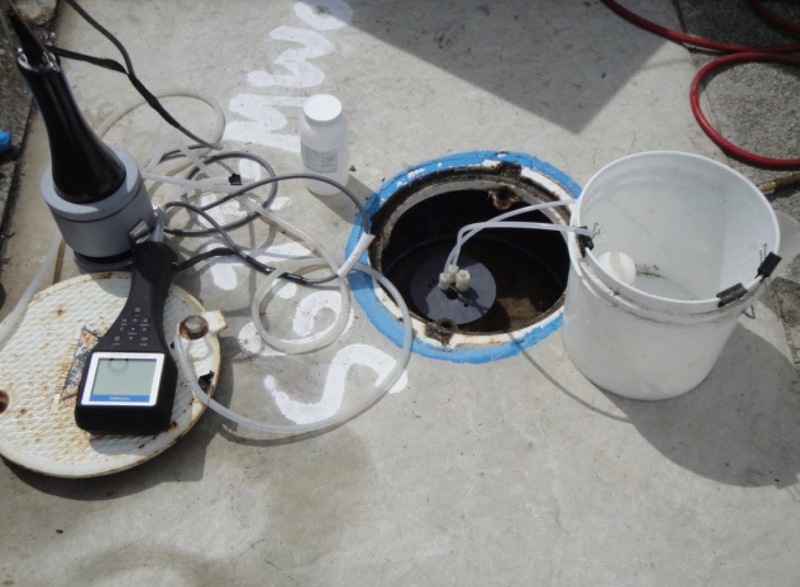 Groundwater monitoring well being installed in Building 41 to monitor chemical oxidation of solvent. Navy photo. Following the first contractor’s cleanup work at Site 6, a separate contractor, SES-Tech, extracted water samples in 2012 and 2013 as part of the Navy’s Basewide Groundwater Monitoring Program. They confirmed that progress had been made, but more treatment was needed. A new contractor for the second cleanup phase specializing in bioremediation, Multimedia Environmental Compliance Group, performed work at the site in 2014 and 2015 using bacteria to break down the remaining solvent. They performed their own testing prior to work, serving as a cross-check on previous work. 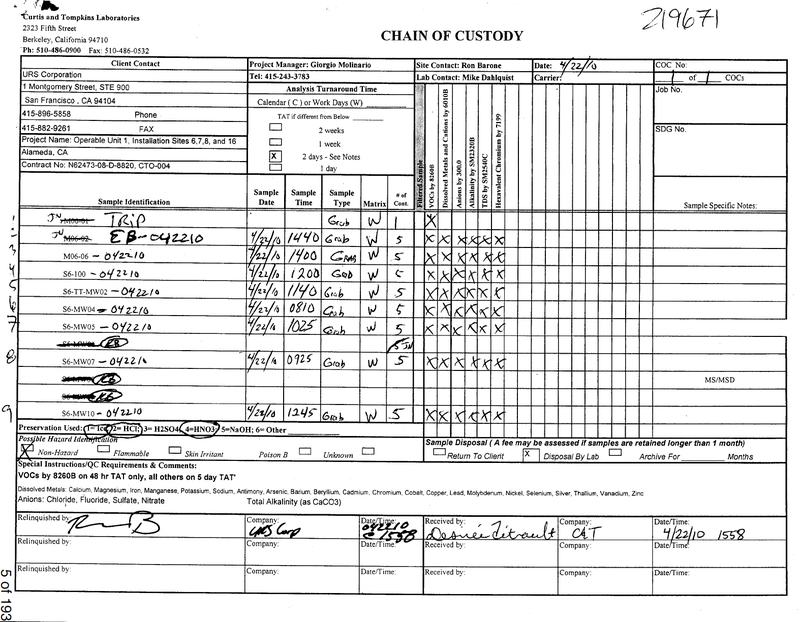 Another safeguard to ensure that cleanup test samples aren’t fake is the Chain of Custody form. It tracks the movement of samples to the independent testing lab. Every cleanup contractor employee knows that they are signing the form under penalty of perjury, a federal crime. They attest to the fact that they took the samples from specific monitoring wells at a specific time on a specific date. 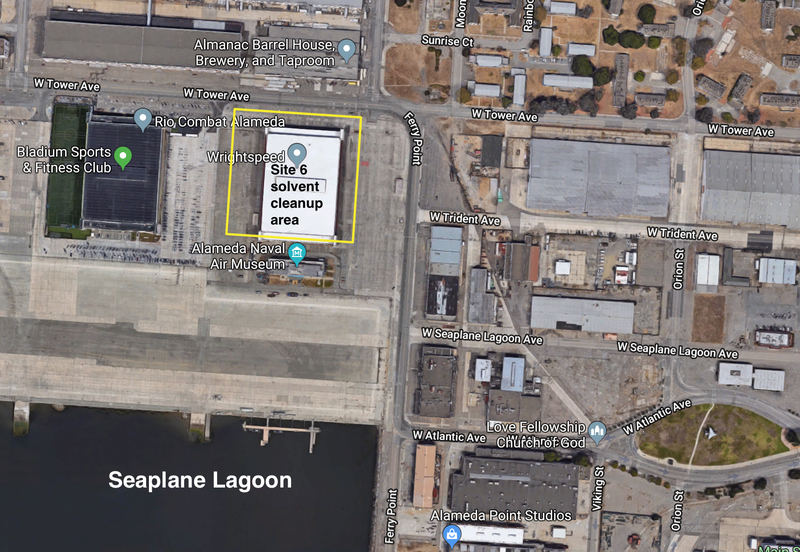 The Navy will appear before the Alameda City Council on July 24 to answer questions about work performed by TetraTech at Alameda Point, the company implicated in the Hunters Point scandal. Inside a groundwater monitoring well used for monitoring oxidation of solvent at Site 6. Navy photo. Old and new monitoring wells where solvent contamination will be treated soon with bacteria. Near the east entrance. Thank you for a convincing description of the state of the art environmental remediation efforts to clean up Alameda Point. Yes, one service provider, TetraTech, falsified data at Hunter’s Point, but as you point out at Alameda Point data from multiple firms and multiple laboratories confirm both the progress and lack of progress made in remediating contaminants at Alameda Point by remedial service providers. Still, we can never have 100% confidence that all contamination has been found and remediated to agreed upon cleanup standards- we can afford to sample and analyze only a small, and hopefully representative, portion of the soil and groundwater there. 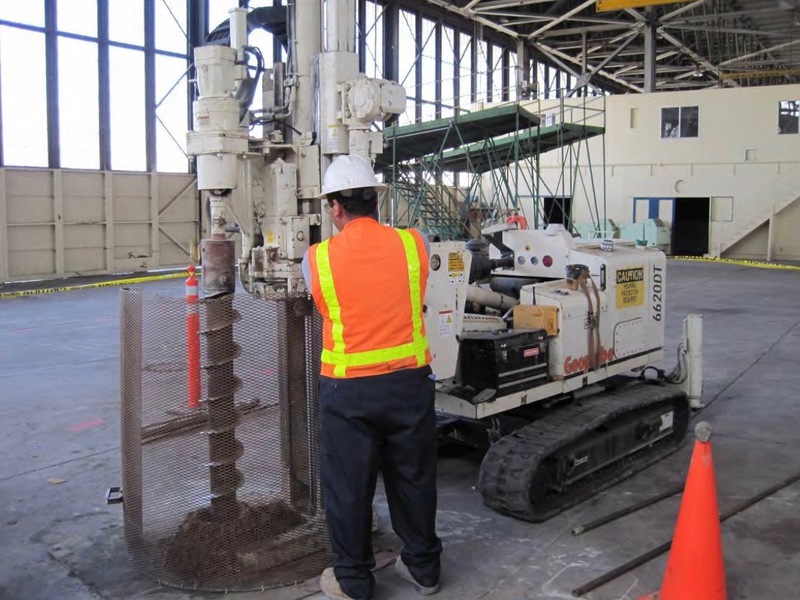 So long after remediation is deemed complete, we must continue to carefully monitor the site, especially when subsequent construction or other activities disturb soil or access groundwater, to confirm the effectiveness of the cleanup and, when necessary, continue the cleanup.